Art is all around at the Wisconsin Union’s Union South and Memorial Union. It’s in our three galleries. It’s on our walls. It’s in our theater and arts events. And, in some places, it’s even on our floors and ceilings. From the beginning, the Union team endeavored to incorporate art into the everyday lives of the students, faculty, staff and guests who visit the Wisconsin Union’s facilities. That was the first Wisconsin Union director’s vision, and it stands true today, more than 90 years after the opening of the Union’s first building, Memorial Union. For example, beginning Feb. 8, Gallery 1308 at Union South will showcase the work of artist Nicole Shaver. Her exhibition “Portraits of Primal Forces” is inspired by geology and a contemporary sublime. In this gallery, Shaver aims to “reach those who have traversed landscape and yearned to hide it in their pocket, as if a stone found on a path”, according to the artist’s statement. You are welcome to view the pieces in-person in Gallery 1308 Feb. 8 through March 29. Click here for more information. Students study in front of the brightly painted Multicultural Murals. Outside of our galleries, is it rare that you will find a space without art, some of which are permanent installations. 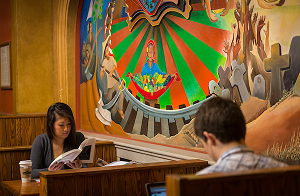 One such installation is the multicultural murals in Memorial Union’s Gekas Commons (formerly known as the Trophy Room). Painted in the ‘90s, these murals began with a request from students to create a representation of students of color within one of the Union’s buildings. Nationally renowned artist Leo Tanguma created the murals, which depict many cultures, including but not limited to Asian-Americans, Native Americans and Puerto Ricans. The paintings aim to depict and inspire unity and strength through diversity and to serve as a reminder of the Union’s role as a gathering place for all. Click here to learn more about the murals’ history and meanings. During your next visit to Union South or Memorial Union, we invite you to take time to truly explore the many forms of art found throughout our buildings and in our programming. 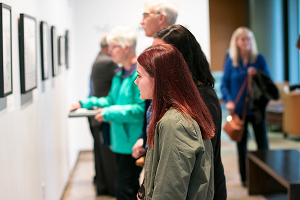 Patrons browse the student-selected Art of Innovation exhibition in the 1308 Gallery. Also, since the Union’s start, University of Wisconsin-Madison students have played a critical role in the Union’s art programming and planning. Student leaders in the Wisconsin Union Directorate (WUD) Art Committee, one of the Union’s programming board committees, curate and collect the galleries’ art with guidance and expertise from Committee Advisor Robin Schmoldt. Robin also manages the Union’s permanent art collection. Robin says that the experiences students have working with WUD Art result in truly transferrable skills for their future careers. To learn more about the WUD Art Committee, visit union.wisc.edu/art. We hope you will come sing, hum, dance and rock with us and engage with our many other forms of art soon. For more information about the Union, including our locations and events, you are welcome to visit, union.wisc.edu.